TV Biznes / Polsat Biznes (Polsat Group) - bussiness news tv station. TV Biznes was a bussiness news TV station that belonged to a private media company Polsat Group. I was working on graphic ID of the station, designing graphics for different programs, presentations and everyday infographics. I was also co-working on the new ID when the channel was turning into Polsat Biznes. TVN Warszawa (ITI Group) - local news tv channel. I started the work before the channel oficially launched and stayed to its official close. I was co-creating the graphic section, applying and modyfing the framework and design of the channel, making various infographics and visualizations for news section and other programs. I was also designing, creating and developing various advanced graphics projects and solutions. AlienFX - professional FX and animation studio. AlienFX is a professional studio specialized in computer animation, special effects and postproductinon. I was mostly working at postproduction, composition, modeling, rendering in bigger and smaller projects. 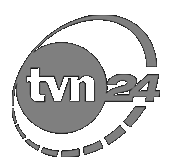 TVN24 (ITI Group) - polish news tv channel. I was working in the main newsroom, creating infographics for a lots of different programs and news. In addition for the things for TVN24 I was also making infographics for "Fakty" in TVN and infographics for TVN Meteo and TVN Turbo.